In the latest epic family movie adventure Ice Age: Collision Course from the highly successful “Ice Age” franchise, audiences worldwide will be propelled to new environments like the cosmos and a crystallized world known as Geotopia, with many of the characters beginning their own new journeys. Scrat is, of course, one character that never changes. In “Ice Age: Collision Course” he continues his pursuit of the cursed acorn. 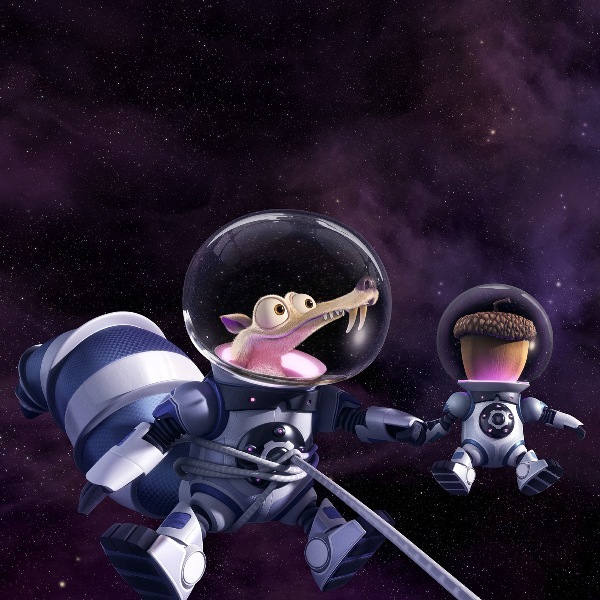 But this time Scrat’s quest is taking him where no Ice Age character has gone before—the cosmos—where the consequences of his antics are nothing short of “Scrat-tastrophic.” Scrat’s epic pursuit of the elusive acorn catapults him into the universe, where he accidentally sets off a series of cosmic events that transform and threaten the Ice Age world. To save themselves, Sid, Manny, Diego and the rest of the herd must leave their home and embark on a quest full of comedy and adventure, as they travel to exotic new lands and encounter a host of colorful new characters. The filmmakers’ new path for Scrat also presents fresh obstacles to overcome. This time, he must deal with gravitational forces, otherworldly technology, and the infinite mysteries of the cosmos. Another connection to the original film—and to its subsequent chapters—is the herd’s relatable family dynamics, which provide heart and emotion, and complement the comedy and adventure. But like most families, the herd must adapt to a world that’s always in flux. “We take our family of characters further than we’ve seen them before,” says Forte. “Ice Age: Collision Course” brings an all-star voice cast with returning and new herd members led by Ray Romano as the voice of Manny the Mammoth, John Leguizamo as Sid, Dennis Leary as Diego, Queen Latifah as Ellie, Jennifer Lopez as Shira, Adam Devine as Julian, Jessie J as Brooke, Jesse Tyler Ferguson as Shangri-llama, Josh Peck as Eddie, Simon Pegg as Buck, Sean William Scott as Crash and Wanda Sykes as Granny. Ice Age: Collision Course opens in cinemas (2D and 3D) on July 6 from 20th Century Fox to be distributed by Warner Bros.